Riverside Farms is the perfect place to hold a New England Barn Wedding. Riverside Farms is one of the most coveted wedding venues on in the north east of the United States and it is home to six renovated, authentic barns. The barn most often used for indoor receptions is the Red Barn. The Red Barn is a large, restored barn, with a red exterior and stained wood interior. The Red Barn makes a New England Barn Wedding a truly enchanting event. Some of the intricate details of the barn’s interior can be seen in the picture above. The most notable is the rustic hardwood floor, made from locally sourced wood. The knots and splits in the wood add to the fairytale cabin ambiance created in the space and give the room character. 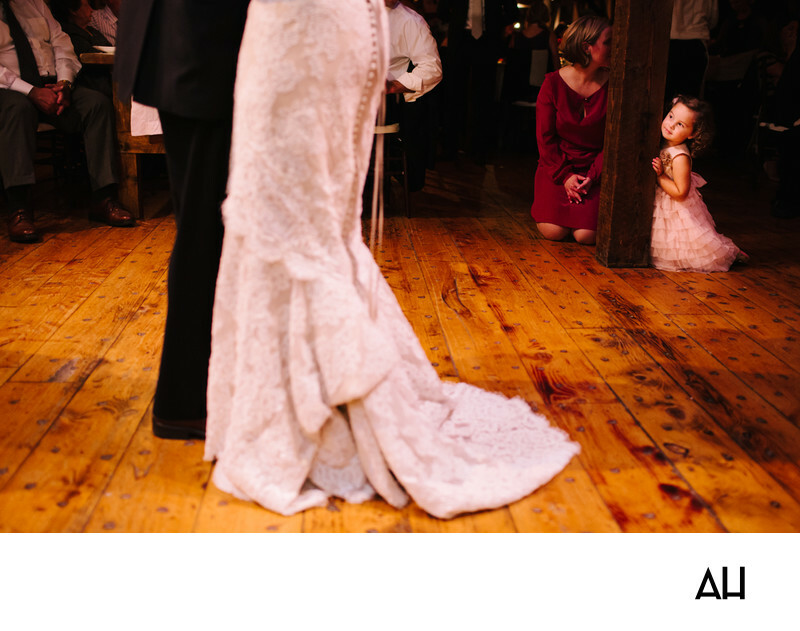 The bride and groom dance across the barn floor for their first dance, swaying with the music that floats through the room. In the picture, the bride is wearing a beautiful vintage gown. Her ivory dress is covered in lace that brushes over the floor as she moves. Satin buttons run down the back of the bride’s dress, adding a final touch of elegance. The groom matches the stated grace of the bride’s attire in a classic tuxedo. He holds his new wife close as guests look on affectionately. One guest in particular has been observing the day -- the little girl who sits in the top right of the photograph. The child wears a pink ruffled dress, and leans against a wooden post as she watches the bride and groom spin about the barn. Her expression is dream-like, and in her young eyes the bride and groom and really a princess and prince sharing a waltz. New England venues include Warfield House Inn at Valley View Farm, Buttermilk Falls Inn, Friedman Farms, The West Monitor Barn, Gedney Farm, The Smith Barn, The Harrington Farm, The Barn On Walnut Hill, Lakefalls Lodge, and Bluewater Farm.